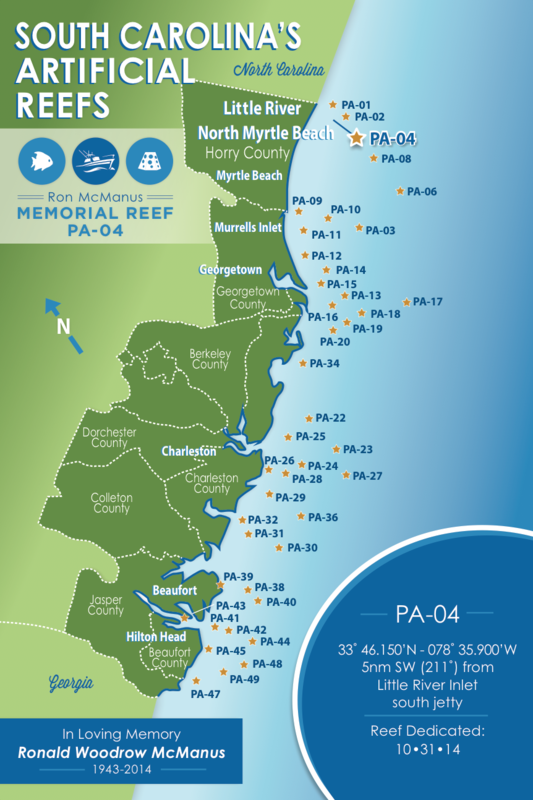 The Ron McManus Memorial Reef (PA-04), located five miles from the Little River Inlet’s south jetty, is part of South Carolina’s man-made reef system. Here, fish of all types will flourish within the hulls of decommissioned military vehicles, ready-made concrete towers and even the perforated shells of concrete mixing trucks. The Ron McManus Memorial Reef will create an underwater home where fishermen, divers and marine life thrive. According to the South Carolina Department of Natural Resources, artificial reefs generate over $83 million annually and create in excess of 1,000 jobs in and around the communities in which they are located. When Ron McManus established the Dixie Chicken Fundament more than 15 years ago in honor of his friend, the late Jim Caudle, he had no idea that this annual fishing tournament would lead to the Jim Caudle Artificial Reef, PA-01. Today that reef is the most visited artificial reef in the State of South Carolina–enhancing our ecosystem, boosting our economy, and providing countless hours of enjoyment for our many sports enthusiasts. What started small grew into something much larger–impacting many and touching our hearts forever.